Civilization.ca - Voyages of Martin Frobisher - Glitter of gold: fraud or self-deception? elief that the "black ore" brought back by Frobisher in 1576 might contain precious metals was the pivotal element in the history of his Arctic expeditions. Various theories have been proposed for why this mistaken belief arose and persisted. It has been suggested that there was deliberate fraud on the part of one or more players in the drama. Multiple tests of the early samples were undertaken by various assayers. 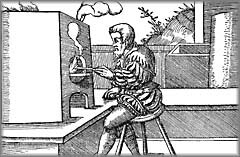 One, Jonas Schutz, managed repeatedly to find at least some gold and argued that others failed because using inadequate equipment. Burchard Kranich was brought in for a second opinion and also achieved positive results, promising that a serious mining expedition would bring back enough rich ore to cover expedition costs. The two rivals did not get along and Schutz charged that Kranich had used chemicals salted with gold. There could be no long-term benefit to either in falsifying results. However, each probably hoped to build reputation and wealth by being made the chief assayer for the enterprise - Kranich did temporarily eclipse Schutz, but it was the latter who was put in charge of operations at the Dartford furnaces. So, if they truly believed the ore contained gold, they may have been prepared to falsify the results of their tests in order to win the ore-processing contract. Frobisher and Lok also had little to gain from intentionally being party to any fraud; Lok was himself misled by Baptista Agnello - more of an alchemist, than a true metallurgist like Schutz or Kranich - who had similarly claimed to have extracted gold from the ore. Yet, whatever their suspicions of the assays, it served the interests of both Lok and Frobisher to go along with the positive findings, since that was the key to funding for further expeditions. How firmly Agnello and Kranich were convinced of the gold is uncertain, for they were subsequently accused of not making serious efforts to smelt the ore assigned to each. The science of assaying at this time was itself imperfect and its own practitioners could be deceived. It is possible that chemicals used in the assaying process might occasionally have been contaminated with small amounts of gold or silver, causing misleading results. Some of the early assays produced only small quantities of such metals - although Schutz and Kranich believed there was more to be extracted; yet modern analysis has shown that most of the ore actually "contained less gold than the average of the Earth's crust". We cannot rule out the possibility that a few ore samples - perhaps particularly the "red ore" mentioned by the sources - did in fact contain significant amounts of gold, but that mining failed to focus on the sources of those particular samples. 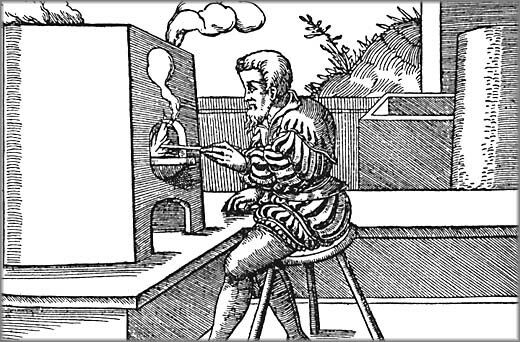 This assayer, working in front of a rectangular furnace, is stirring the molten ore with a stick. A further possibility is that the wealthy Elizabethan courtiers, aware of the precious metals being retrieved from the Americas by the Spanish and eager to tap into similar riches, simply wanted to believe. That the majority of the analyses by reputable assayers suggested the ore was worthless could be interpreted as a failure to find what a few assays - conducted by men trained in Germany, the leading centre of metallurgy - had evidently shown to be present. Schutz continued to blame the equipment when the large-scale smelter at Dartford produced even more disappointing results than had the small-scale assays in London, but fled abroad once it was clear that investors had abandoned all hope of the ore being worth anything. These courtiers had the money and inclination to speculate on ventures, in the hopes that one would pay off. Their gold-fever fed the determination to mine ore in the Arctic. All these factors may have worked together to persuade even the skeptical to support the second expedition, while fear of losing the investment therein (along with imperialistic ambitions of Elizabeth and her advisors) was added to the motivations behind the third and most expensive expedition. All that glitters may not be gold, but the prospect of gold was too glittering an illusion for the Elizabethans to resist.